A man writes on a Samsung Galaxy Note 5 at the product's launch event in New York yesterday. Samsung unveiled a new Galaxy Note phablet and a larger version of its curved-screen S6 Edge smartphone yesterday, marking a fresh bid by the South Korean company to revive momentum in its handset business. Samsung is the world's top smartphone maker but its market share fell in the second quarter when the company released its critically acclaimed S6 models, squeezed by Apple's upscale iPhones and cheaper offerings from Chinese rivals such as Huawei. The event announcing the new gadgets yesterday was attended by more than 1 000 people, almost filling the Alice Tully Hall at the Lincoln Centre in New York. Samsung has made several hardware changes for the new devices, including a faster processor for the Galaxy Note 5 and increasing the screen size of the S6 Edge+ to 5.7-inches, from 5.1-inches on the S6 Edge. 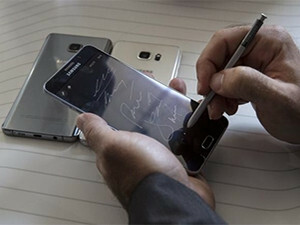 Samsung has high hopes for the Note. "Each new version has been more popular than the last," said Justin Denison, VP of product strategy and marketing for Samsung Electronics America. The phones will go on sale on 21 August in the United States and Canada. They will be available via the four major carriers: AT&T, Verizon, T-Mobile and Sprint. 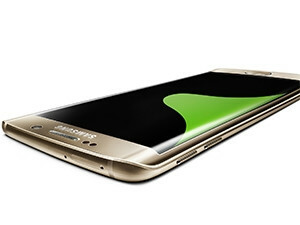 Samsung increased the screen size of the S6 Edge+ to 5.7-inches, from 5.1-inches on the S6 Edge. Roubini said they may frustrate Android users. "The phone looks very cool, but you cannot change the battery, and you cannot add memory to it." Samsung shares closed at 1 140 000 won yesterday, down 1.21%. Samsung also said its mobile payment service Samsung Pay will launch on 20 August in South Korea and 28 September in the United States. Samsung Pay lets users make payments by having phones send signals to existing magnetic stripe card readers, offering greater store coverage than Apple's Apple Pay service, which requires retailers to install compatible equipment. The payments service will expand to the United Kingdom, Spain and China, the company said, without specifying dates.